Doesn’t this look like spring? 2. Grease an 8×8 inch baking dish with butter and set aside. 3. Zest and juice two lemons and set aside. 4. In the bowl of an electric mixture fitted with the paddle attachment, beat the flour, sugar, salt, and softened butter until combined. 5. In a separate bowl, whisk together the eggs, lemon zest, and lemon juice until combined. 6. Pour it into the flour mixture and beat for 2 mins at medium speed until smooth and creamy. 7. Pour into baking dish and bake for 23-25 mins, should turn golden around the edges. 8. Allow to cool completely before glazing. Do not overbake, or the bars will dry. 9. 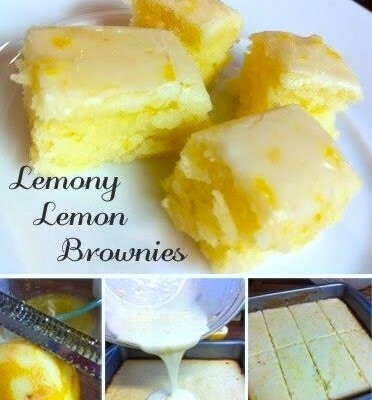 Filter the powdered sugar and whisk with lemon zest and juice. 10. Spread the glaze over the brownies with a rubber spatula and let glaze set. 11. Cut into bars and serve. Please keep me posted as to what you think.